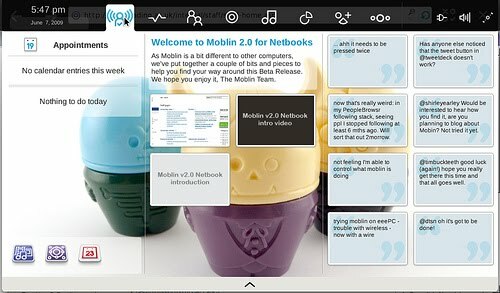 That is because Meego 1.0 is in fact moblin 2.3 which was re-branded Meego 1.0. Just like maemo6, meego 1.0 is still just meego in name but moblin in codes. The real meego release would replace the GTK/Clutter UI with something based on Qt and hence completely different from the Present UI of "meego 1"
Meego 1.0 is the merging of the core components(the underlying libraries) of Moblin and Maemo. The interface(the user experience as they call it) is different for different types of devices. At this point only the netbook user experience was released(the mobile interface coming in October) and if you search youtube for Meego+tablet+computex you will find a completely different interface(user experience). Also take in consideration that it will have an app store and the user experiences will probably be available in several distros in the future(my base for that statement is Mandriva 2010.0 has Moblin packaged in their repos). 'till now, all I can see is a pile of .net courtesy of Microsoft through Novell. If that's what they want to deliver - it won't go anywhere near any of my devices. Ever. BigBrovar, you're always beating me to the comments on this sort of thing... in case others missed it, bigbrovar is exactly right. 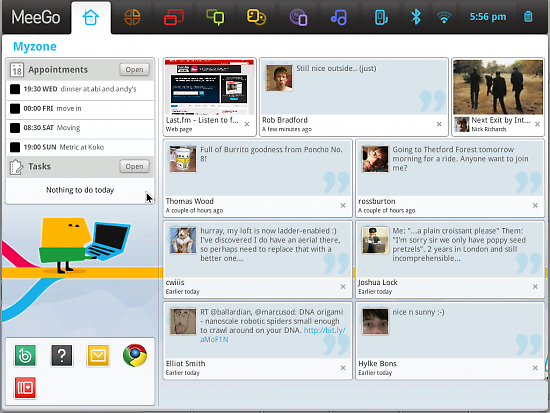 If you expect MeeGo to be a dramatic UI change compared to Maemo, or Moblin in version 1.0, you're sadly mistaken. "when a new netbook focused distro comes to maturity"
This where you get it wrong : MeeGo 1.0, contrary to what its name seems to indicate is a developer version. Nobody is going to ship it (free software enthousiasts will try it, but it is a different story). I recently tried MeeGo on my MSI Wind netbook, and was disappointed when the Wifi didn't work, since it worked fine on the same laptop with Moblin last year.